Casey Mize looked every bit the part of a No. 1 overall pick making his professional debut in the Gulf Coast League on Thursday afternoon. He pitched in dominant fashion. The Tigers' top prospect struck out four and allowed one walk over two scoreless innings for the GCL Tigers West against the GCL Yankees East in his first Minor League outing. Mize faced only seven batters in total and fanned four of them -- each on swinging third strikes. He retired the first five batters he faced before walking Avery Tuck in the second inning for his only baserunner allowed. This was expected to be his only GCL start before moving to a higher league. Mize's next outing is likely to come with Class A Advanced Lakeland next Tuesday, when he's expected to throw three or four innings, according The Athletic's Emily Waldon. Mize signed for a $7.5 million bonus one month ago after being selected first overall out of Auburn. That was tied for the second-highest bonus ever given to a Draft pick, trailing only the $8 million Gerrit Cole got from the Pirates in 2011 before the bonus pool restrictions took place. 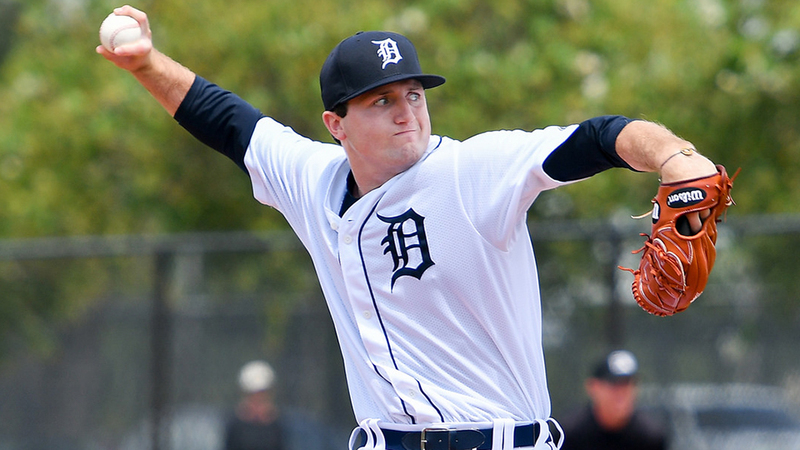 He posted a 3.30 ERA and 0.87 WHIP with 156 strikeouts and only 16 walks in 114 2/3 innings during his junior campaign, and that workload that has Detroit being cautious with the 21-year-old right-hander in his first summer as a pro. Those stats are also what made him one of the most exciting right-handed pitching prospects in the game even before taking the mound Thursday. Mize is ranked as MLB.com's No. 20 overall prospect on the strength of plus-plus splitter and plus fastball and slider. The whole package, which is already incredibly good, plays up even more because of Mize's control of it -- he posted 1.3 BB/9 and 9.8 K/BB ratios this spring. The Alabama native's addition to the rankings means Detroit boasts right-handed pitching prospects in each of its top five spots in MLB.com's organizational rankings. Mize slots in ahead of Franklin Perez, Matt Manning, Alex Faedo and Beau Burrows -- each of whom also figure in the overall top 100.